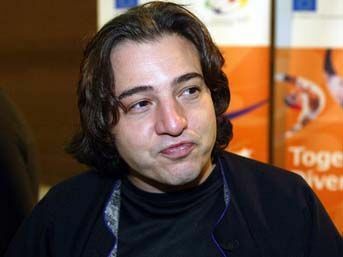 Fazıl Say, age 42, is known internationally as one of the best Turkish musical composers and performers. He has appeared with the New York Philharmonic and in concert halls around the world, from Paris to Tokyo, as well as in Turkey. His achievements include countless sonatas, concertos, oratorios, and several symphonies. He is engaged in ongoing work on an opera commemorating the 37 victims of an Islamist arson attack on a cultural festival held by members of the heterodox Alevi Muslim community in Sivas, a city in east-central Turkey, in 1993. Say appeared in an Istanbul court on October 18 and was charged with hate speech and insulting religion for Twitter messages mocking the conduct and beliefs of Islamic fundamentalists. He faces a potential sentence of 18 months in prison. In one tweet, he commented on a muezzin, who calls Muslims to prayer, for his hurried style. In traditional Islam, the call to prayer, or ezan, is supposed to be delivered melodiously; muezzins from different mosques compete to see who can recite it in the most extended and pleasing tones (even though it is now usually played on speakers from a sound recording at the top of a minaret, rather than being rendered by a live person). A Muslim adage says that a discordant call to prayer or an ugly mosque is against religion. But following the example of the Saudi Wahhabi sect, fundamentalist muezzins now read out the call to prayer in a brusque manner resembling that of a grumpy public transit driver announcing a series of stops. Apparently reflecting his distaste for the spread of fundamentalism in Turkey, Say tweeted a complaint about a call to prayer that lasted only 22 seconds, and added, "Why such haste? Do you have a mistress or a glass of raki [Turkish liquor] waiting?" In another message, he quoted the classical Persian poet Omar Khayyam, who asked if heaven should be considered a tavern or whorehouse, since it is described in the Koran as a place where wine is served by virgins. A third tweet by Say remarked, "I am not sure if you have also realized it, but if there's a louse, a non-entity, a lowlife, a thief or a fool, it is always an Islamist." The Turkish prosecutors in the case argued that Say's tweets "threatened public order." Under the neo-fundamentalist Justice and Development Party, or AKP, led by prime minister Recep Tayyip Erdoğan, Turkey has taken the initiative in new efforts by the Saudi-based Organization of Islamic Cooperation (OIC), comprised of 56 nations, and headed by a Turkish diplomat, Ekmeleddin İhsanoğlu, to adopt internationally laws which would make "defamation of religion" a crime. Say defended himself based on Turkish constitutional guarantees of freedom of speech and belief, and article 10 of the European Convention on Human Rights, which supports free expression. But the prosecution argued that Say's tweets did not constitute "criticism protected by international and national laws on freedom of speech." The court authorized a criminal complaint against the composer. Say's case was adjourned until next February. Many prominent personalities, including Egemen Bağiş, Erdoğan's cabinet minister for relations with the European Union, have called for the case to be dismissed. The Say case resembles that of Hamza Kashgari, aged 23, a Saudi journalist and poet from a Uighur Muslim family that emigrated to the kingdom from Chinese-occupied Eastern Turkestan. Kashgari was denounced in February for a tweet expressing his ambivalent feelings about the Prophet Muhammad. Kashgari attempted to escape to New Zealand, but was arrested en route in Malaysia and handed back to the Saudi authorities. He was charged with "apostasy," and since last February has been held without trial in Saudi Arabia. In both cases, the statements of creative people – a composer and a poet – appeared as pretexts for persecution because of their prior criticism of governmental actions. Fazıl Say had accused Erdoğan and his government of destroying cultural traditions and pursuing harmful social policies. Say defended Turkey's secular institutions and condemned insistently Erdoğan's "re-Islamization" efforts. Hamza Kashgari had written newspaper columns castigating the failure of municipal officials in Jeddah, the Saudi commercial center, to protect residents from disastrous flooding in January 2011, and questioning the activities of the country's "morals militia," often incorrectly referred to as the "religious police." Say and Kashgari were both placed on blacklists by the rulers of their countries, in anticipation that they could eventually be silenced – an event that was scandalous in the Say case because of his worldwide renown as a musician. Legal charges of religious apostasy and blasphemy are abominable in any case, and should not be permitted. Fazıl Say is a declared atheist and has expressed his desire to leave Turkey for Japan. About 100 people demonstrated against his indictment in front of the court in Istanbul, and members of the German Bundestag from across the political spectrum expressed their concern at the repressive attitude of the Erdoğan regime. Sevim Dağdelen, a female Bundestag member of Turkish background, who represent the Left Party, said, "In a democratic and secular constitutional state mere expression of opinion may not lead to harsh criminal charges and long prison terms." The case of Fazıl Say exposes the falsity of the modern and democratic image of Turkey that the Erdoğan government is trying to project to the world. Free speech is limited to members of the political elite – except for criticism of religion, which is prohibited even to them. As the influential journalist Semih İdiz wrote in the leading Turkish daily Hürriyet on October 23, the case against Fazıl Say "has nothing to do with 'justice' in the objective sense of the word… Say has become a nemesis for most Justice and Development Party (AKP) followers and religious conservatives, who would be more than happy to see him receive a prison sentence, regardless of what this does to Turkey's image abroad. As for his 'virtuosity' and 'international fame' these mean little for a large proportion of the conservative Turkish public, which has no appreciation of Western classical music – or any form of Western high culture – anyway." İdiz expressed his doubt that the outcome of the Fazıl Say case will demonstrate that the current Turkish government has a positive commitment to freedom of speech.